Marco needs our help in FarmVille Marco’s Masterpiece, a FarmVille Holiday Lights Chapter 4 Quests. Marco is an artiste and he designs all of the fanfare you’ll see in Hollybright! He will need some hand in one of his master piece so we will gonna help him through out this FarmVille mission. On this chapter of Holiday Lights quests, we will be planting a 3 day crop called Fa La La La-Lavender. It will be asked in the last stage of the quest. Save at least one Instagrow for this part and use it just in case you fall short of time. We will also be asked to build a Hollybright Zoo. We will need 10 of the following materials to build it Wrench, Shrub and Pipe. Note: Expected release date is on Monday, Nov 25. Info: Craft any of the following Sparkle Lights items at the Craftshop eg. Sparkle Lights Chest, Sparkle Lights Crate and Sparkle Lights Buckets. Info: Crafted at the Hollybright Park for 5 mins and it will need Holiday Feed x2. 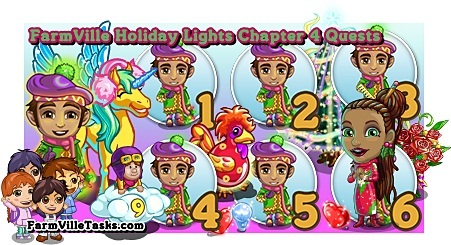 Holiday Lights Chapter 4 Quests 3: FarmVille (Be)hold the Lights! Info: Crafted in a level 2 Sparkle Cafe and it will need Borealis Blueberries Bushel x3, Auroral Corn Bushel x2 and Strawberry Bushel x2. Info: Place and harvest the Snowy Horse in a Horse Paddock. Can you please tell where the sparkling lights go after you craft them? They go into your gift box and can then used to open presents at your Hollybright Tree. You also get more each time you harvest crops on Holiday Lights. I never find them in the gift box. I have crafted a few but never used them because they are nowhere to be found! I don’t know that they’re stored in the giftbox, but when you go inside the tree, it shows how many you have. Click on each wrapped present and you’ll use the sparking lights to open them. I know that. The problem is that I craft them but they disappear. They do not go to the tree or to the gift box.